Basketball, the most American of sports (after what you call "football" and baseball), was actually invented by a Canadian. Quick, how many Canadian players can you name in the NBA today? 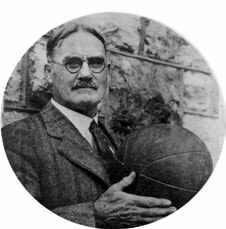 James Naismith was born in small-town Ontario in 1861. Never much of a student, he was very outdoorsy and excelled at athletic games, especially at something called "duck on a rock." Apparently kids in Ontario in the mid-1800s (much like kids everywhere at all times) were really friggin' bored, and played a game where you chucked rocks at other rocks. While most would consider this a waste of time, Naismith parlayed the skills and strategy of "duck on a rock" into what would one-day become a sport for which Kobe Bryant is paid $25 million a year to play. Naismith studied Physical Education at the University of McGill in Montreal, and for a pretty nerdy-looking guy was quite an athlete, representing McGill in Canadian "football," lacrosse, rugby, soccer (actual football) and gymnastics. After graduation and teaching at McGill for awhile he moved to Springfield, Massachusetts to teach at the YMCA International Training School, where he was greeted by a "rowdy" class who grew bored and disruptive after being forced to play sports indoors during the winter months. Naismith's response to this? Make'em play duck on a rock. Except with soccer balls and a peach basket. So there you have it, the humble beginnings of a sport that now boasts teams worth billions of dollars. And it was all thanks to a Canadian PhysEd teacher with a bitchin' mustache. My one big question: Why did a Canadian, trying to find a sport for people to play in the winter, decide to make up a new sport? Especially since the first organized ice hockey games in history were played at McGill right around the time when Naismith was a student there? Do they not have sticks and ice in Massachusetts?